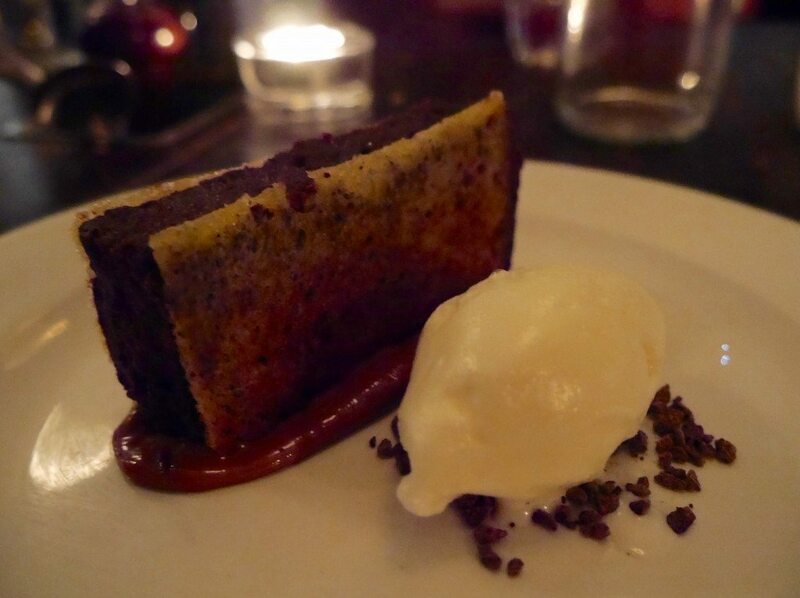 It was my good friend William’s birthday last week so he rounded up a small troop of foodies and lovingly guided us to 8 Hoxton Square for a celebratory meal. Although naturally a few festive pre-dinner drinks were in order first. Luckily for us, 8 Hoxton Square is neighbour to the ultra-cool and highly secretive basement bar Happiness Forgets, which describes itself as “High End Cocktails, Low Rent Basement”, which I personally think is quite fantastic. More importantly, it lives up to its slogan and delivers some cracking good drinks in a very dimly-lit, romantic & chilled space. My first cocktail disappeared in under a minute; I simply couldn’t resist gulping it down (…and it was long). I highly recommend popping by this bar if you are in the area, or even if you aren’t, but be warned that it’s extremely popular – it was packed on a Wednesday evening. However, the good news is that they take bookings! 8 Hoxton Square is the little sister to 10 Greek Street, a tremendously popular restaurant in Soho that has a reputation for delivering excellent food made from top quality, seasonal ingredients. But since it’s located in Soho, it ‘obviously’ doesn’t take bookings, and the wait can become rather lengthy rather quickly, as I discovered a year ago when I took my mum for her birthday. But the wait had proved worth it. 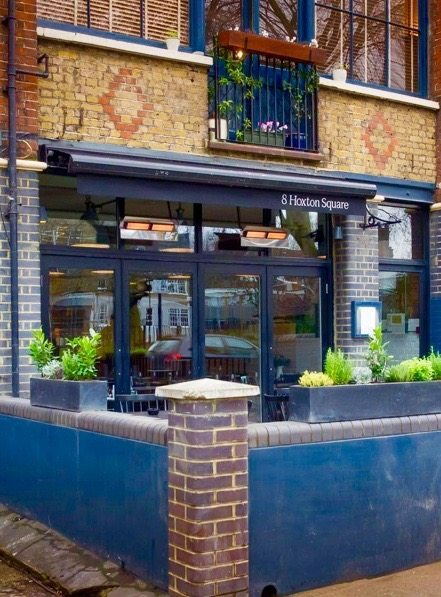 So it was with high expectations that I entered 8 Hoxton Square (where I feel I should add that you CAN make a reservation!). 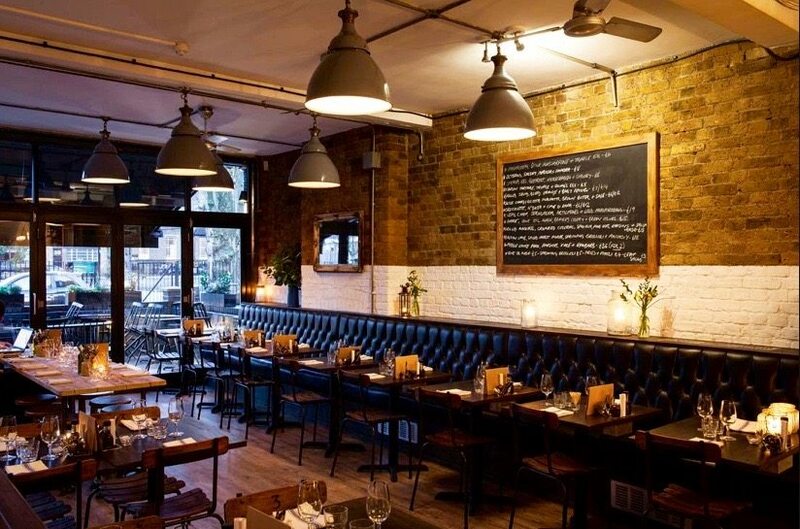 Service: From the moment we walked through the door I knew that I would be a fan of the style of service at 8 Hoxton Square. The waiters were all dressed in casual clothing with untucked shirts and looked very relaxed in the homely environment. As expected, the three waiters on shift were all incredibly friendly & helpful. Before long, the most outrageously delicious bread was placed before our beady eyes and we wasted no time getting stuck in (more about that later). Though I will say that as the evening went on and the continuous requests for more of the divine dough did not relent, the speed & size of its delivery noticeably waned, but I think that this should fairly be forgiven. Otherwise, the food all arrived very timely, and they were sensible enough to deem William ‘worthy’ of their Little Black Book, the contents of which no man ever shares overly willingly. 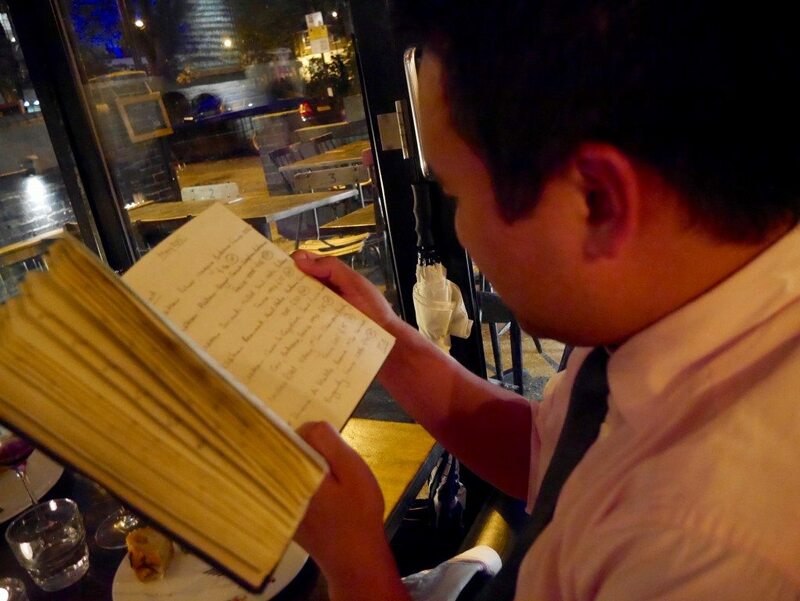 Although this LBB is unique in that instead of containing girls’ names & numbers, this hand-scrawled, leather bound book lists specialty wines of the month, of which they only stock a handful of bottles. I am told the book contains ‘serious wines’ at a real bargain. The compliments from the others on the quality of the wine flowed for the rest of the evening (whilst I was none the wiser… shh). Ambience: The restaurant is warm and inviting, with similar décor to its big sister. Stained wooden floor boards, tables & chairs, and exposed brick walls with hues of dark browns & greys and a contrasting strip of white, create a relaxed and attractive dining room. The oversized grey dome lamps and black booth seating running along the far back wall add stylish formality to the room. Whilst the candles flickering in large domes, simple fresh flowers and hand-scribbled chalkboard menus ensure a laid-back ambience is the presiding theme. Food: First, the bread. 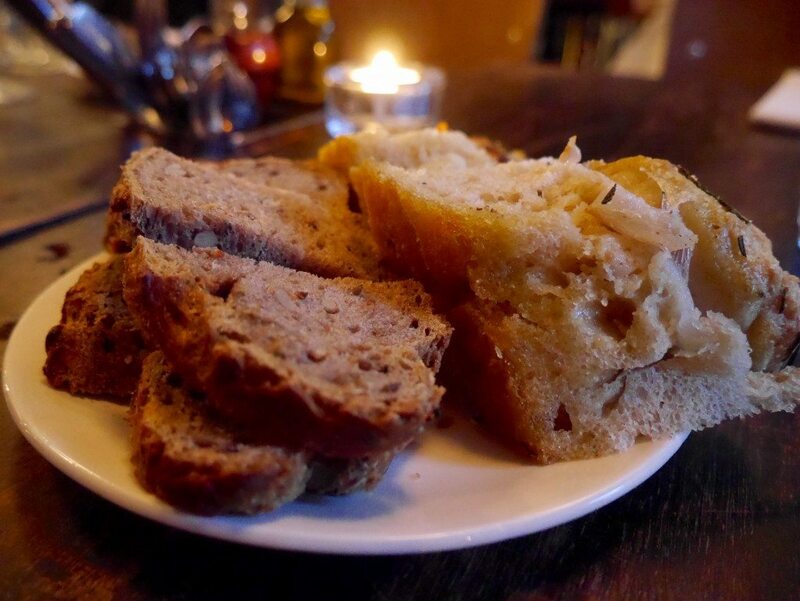 So I am going to make a very bold statement and say that 8 Hoxton Square served me the best bread that I have ever eaten. I know, bold. But true. The rosemary focaccia was the hands-down winner for me, with a slightly fried & fragrant crust that quite literally melted away in your mouth to allow you to munch deeper into the incredibly fresh & springy dough below. A close second was the bacon bread. 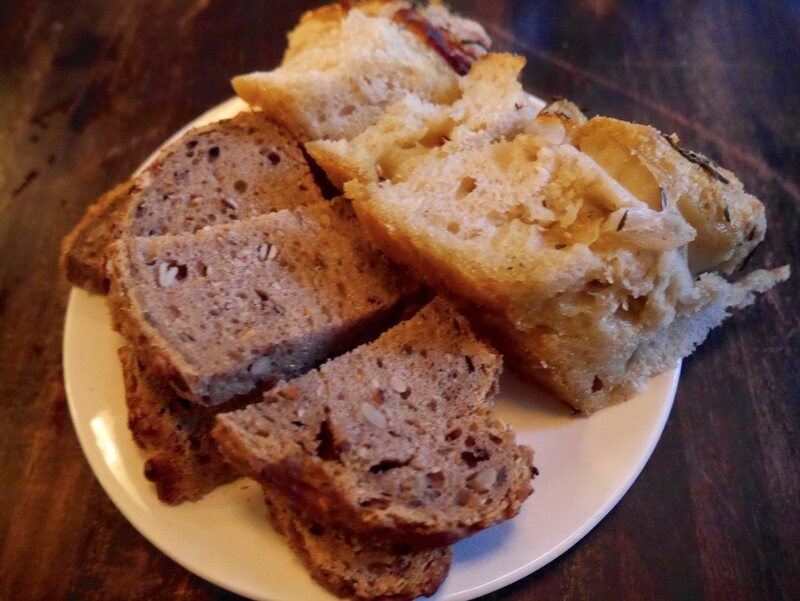 Yes, it’s as you’re imagining – bread filled with small cubes of succulent, cured, meaty bacon. Divine. The last in the trio of breads deserves a short mention as a very good wholemeal loaf, although it had nothing on its delectable companions. We must have gotten through a fair-sized loaf of each. We had bread with everything, and even joked that we should have had bread with dessert (although I was being deadly serious). 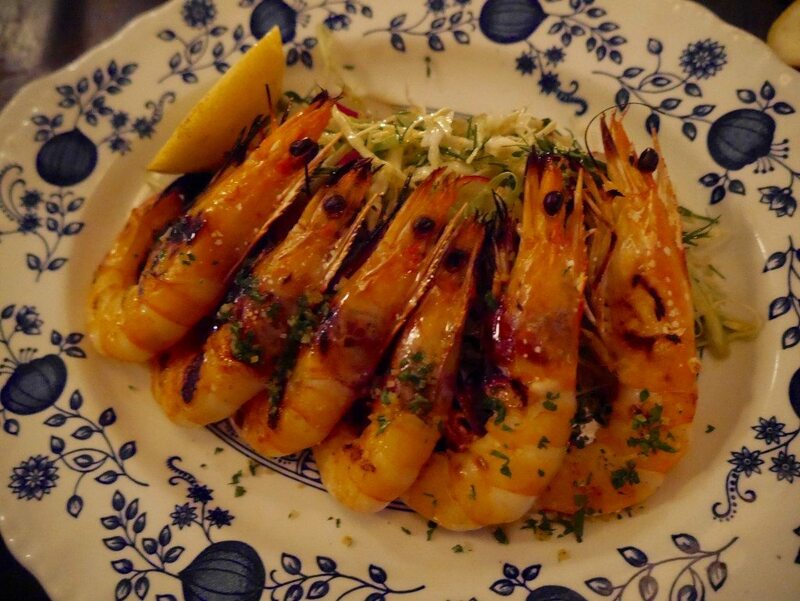 As for the food that you actually pay for, 8 Hoxton Square and 10 Greek Street both operate a daily-changing menu, to provide you the best dishes with the freshest ingredients possible. Although this instantly puts me on my guard as I like to arrive at a restaurant having fully studied the menu and knowing precisely what I am going to order, you need not fear when it comes to this wonderful duo. There is plenty of choice and all of the dishes are designed as either small or large sharing plates, so if you don’t love something, just be sure to get your mits furthest into the plate of food that you do. We shared every single dish and it worked wonderfully. 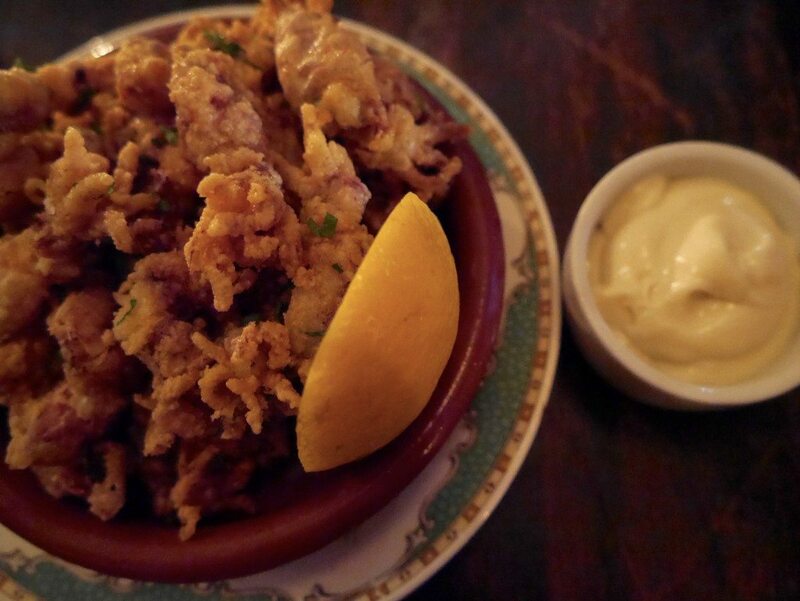 Our first round of ‘picky bits’ consisted of the Padron peppers (£6.00), fried baby squid (£7.00) and Gorgonzola custard (£7.00). 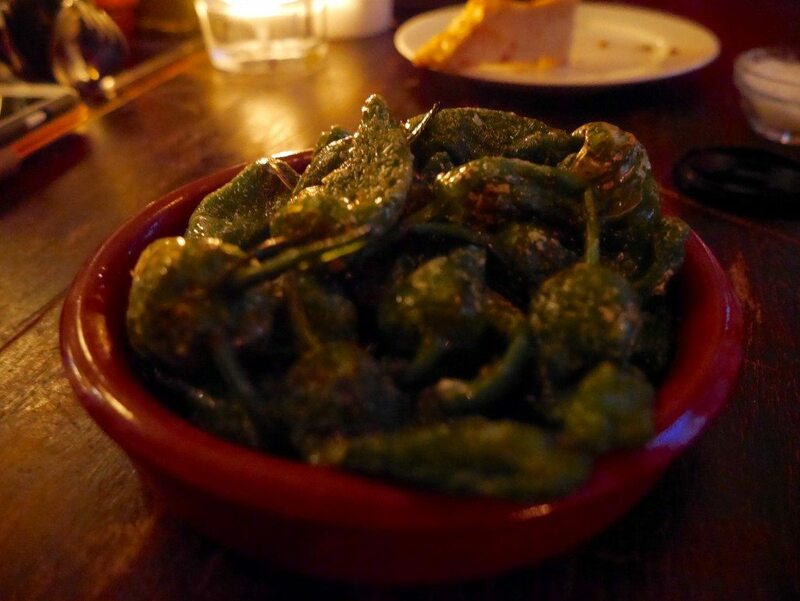 The Padron peppers were well-executed, with the right amount of char, salt and oil, and were far better than those that Michael and I had at Opera Tavern. The fried baby squid, however, was not at all to my taste. Usually a huge fan of this dish, I was wildly disappointed by the chewy tentacles encased in soft, slightly greasy batter. 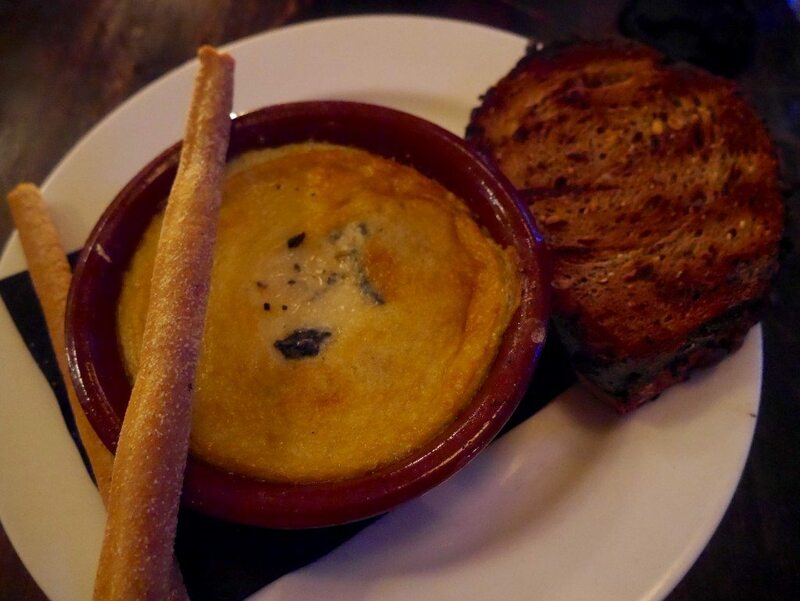 As a non-cheese lover I didn’t try the Gorgonzola ‘custard’ myself, but the “mmm’s” and “ahh’s” around the table were rather telling of the dish’s success. 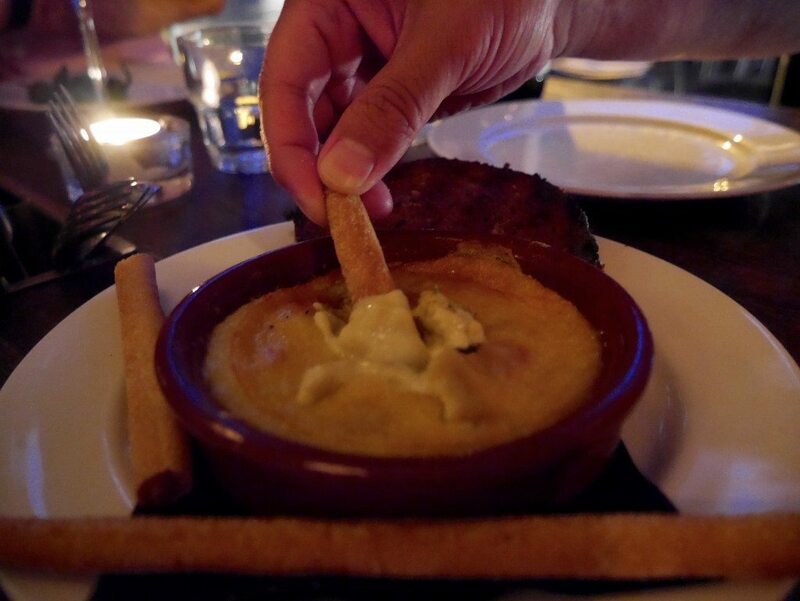 Resembling a crème brulee, my fellow diners mopped up every last morsel with the accompanying crisp sticks of grissini with joyous expressions. Our next round of food included the salt beef, pickled cucumber & horseradish (£8.00), the grilled prawns, spring cabbage & radish (£16.00), and gnudi with leeks, wild garlic & morels (£14.00). The salt beef was sensational. The meat was butter-soft and moist, and pristinely pink in colour. The pickled cucumbers added sharpness to the dish, which was balanced by the mild, creamy horseradish and sprinkling of fresh, flavoursome dill. 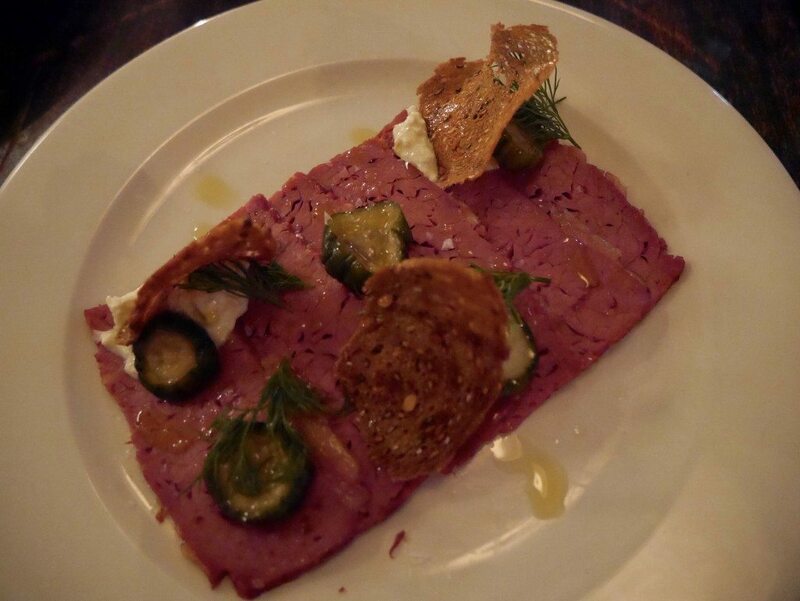 The thin bread crisps were entirely unnecessary, as I could have eaten the beautiful beef as a meal on its own. 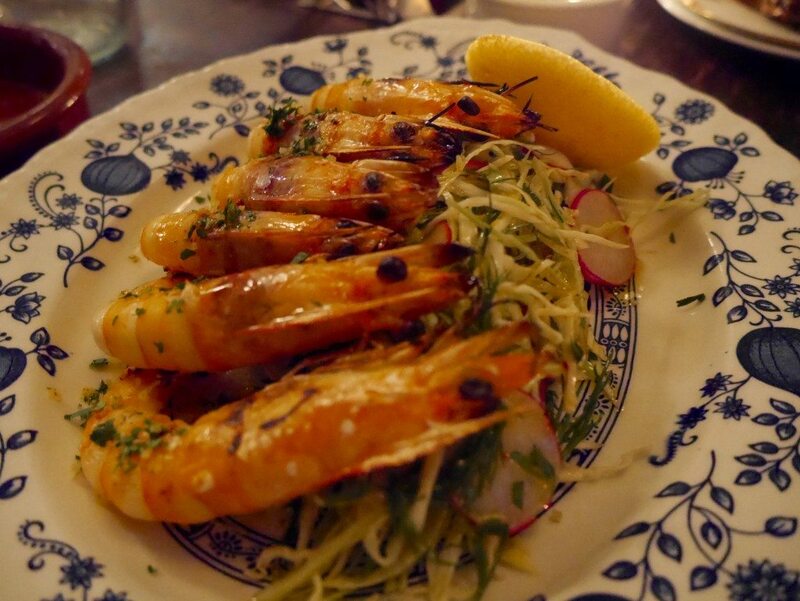 The grilled prawns weren’t nearly as big a hit with me. Plump and well-cooked, but lacking in seasoning, sauce and condiments. Served cold, they gave me as much pleasure as a packet of pre-cooked prawns from Tesco. 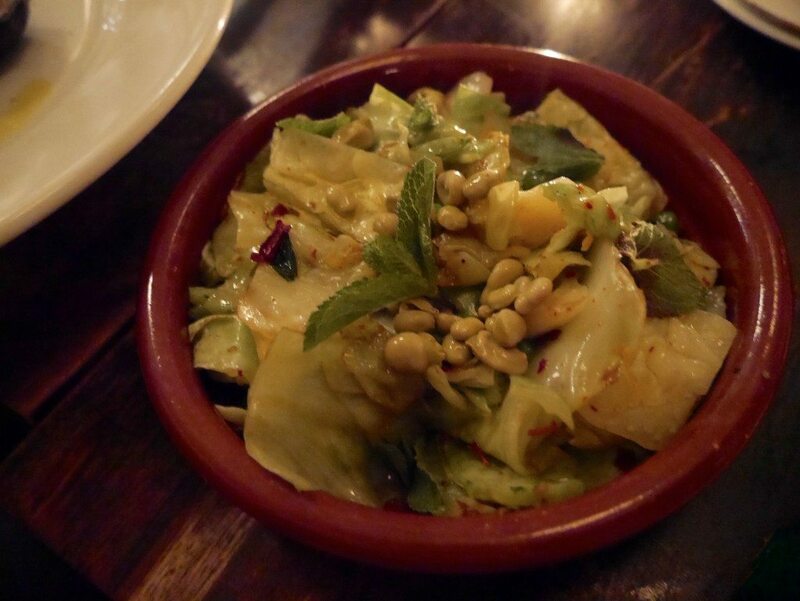 The spring cabbage and radish added nothing and I found the overall dish rather bland, dry and unexciting. 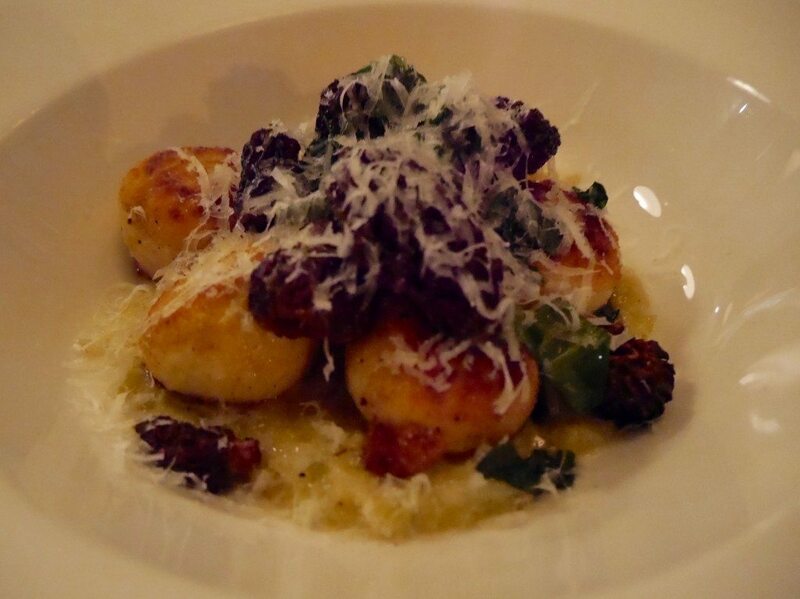 The gnudi, on the other hand, was a dish of the Gods. Gnudi is a type of gnocchi made from ricotta cheese and flour, resulting in a small dumpling that is light, fluffy, and creamy, and dangerously delicious. Despite not being a fan of cheese, even with the liberal sprinkling of parmesan, this dish blew me away and I had more than my fair share. The morels were firm and added texture as well as delightful earthiness. It was truly exquisite. Such praise cannot be sung for the fries & aioli (£4.00), however, which were over-crisp, over-dense and, quite frankly, a real letdown. The aioli wasn’t even able to save them, which is pretty shocking. 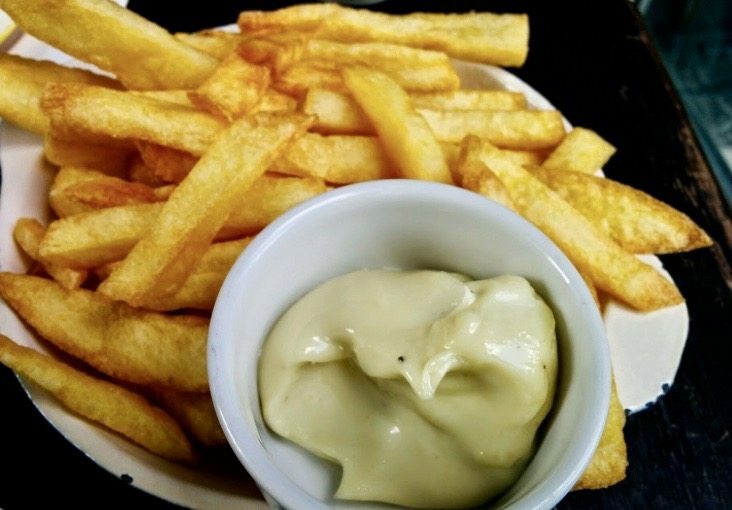 (P.S., if you’re in the market for the most amazing house mayo to smother your fries in, I can’t recommend the sensational dips at Hotbox or Mildred’s more!). 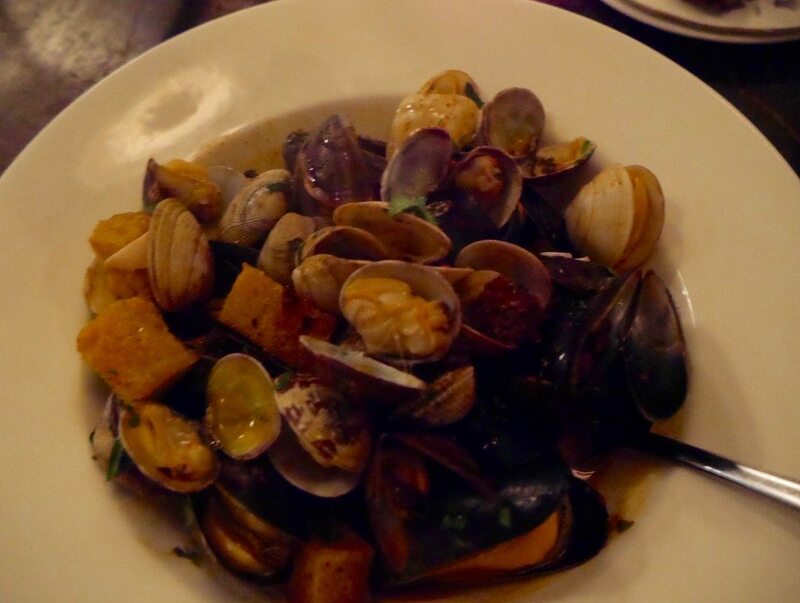 The mussels, clams, merguez & harissa (£16.00) was simply OK. There wasn’t enough seafood in the dish to justify the price, and the mussels were gritty, which is a pretty serious no-no. I also wasn’t a fan of the texture of the merguez sausage, which I found to be strangely chewy & crumbly at the same time. I thought it tasted overcooked and would personally have preferred a replacement of chorizo instead. Hunks of bread submerged in the sauce also added a slightly soggy element to the dish. Overall, I found it a little strange. The best part was the slightly spicy & rich harissa sauce. 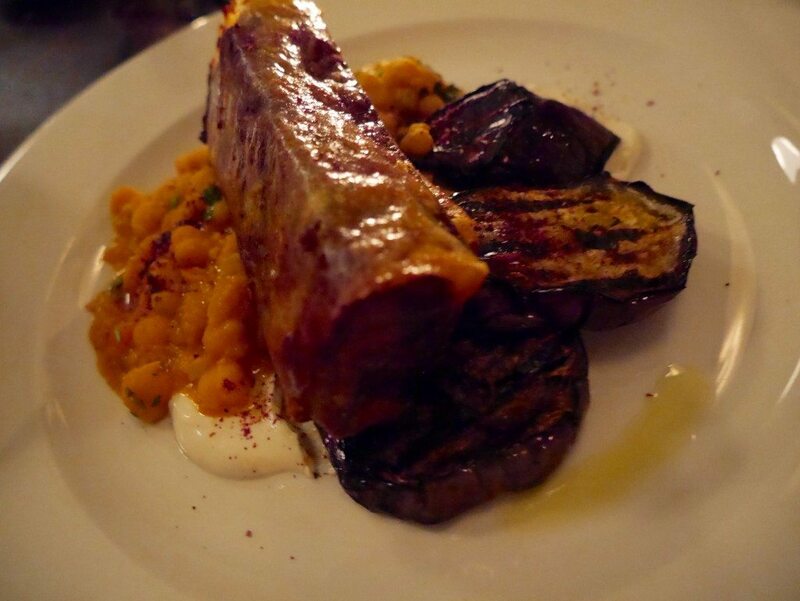 Next arrived the Brecon lamb, brik, chickpeas, aubergine & yoghurt (£19.00) and spring greens (£4.00). The lamb was utterly extraordinary. I’m not joking, a week later we are still talking about it; it was that damn good. The lamb itself had a crisp outer skin which encased the most flavoursome, juicy meat. 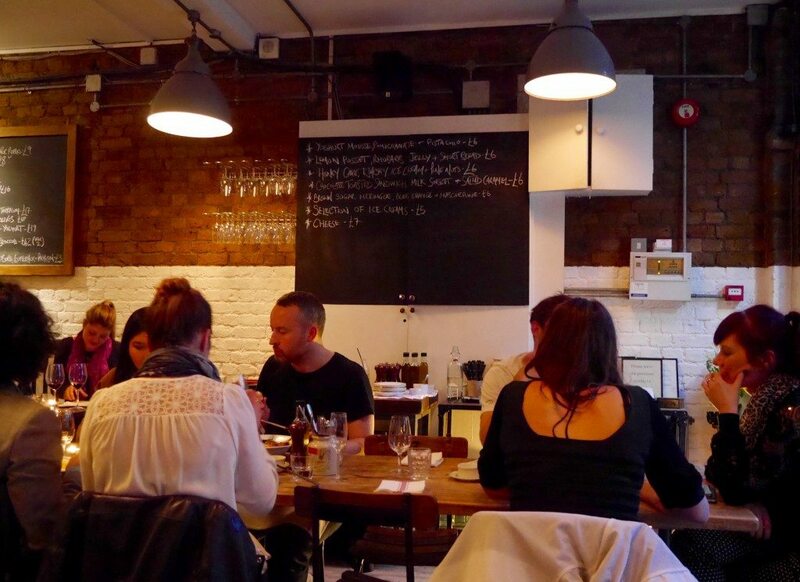 I could have eaten just lamb for dinner and left 8 Hoxton Square a very happy customer. 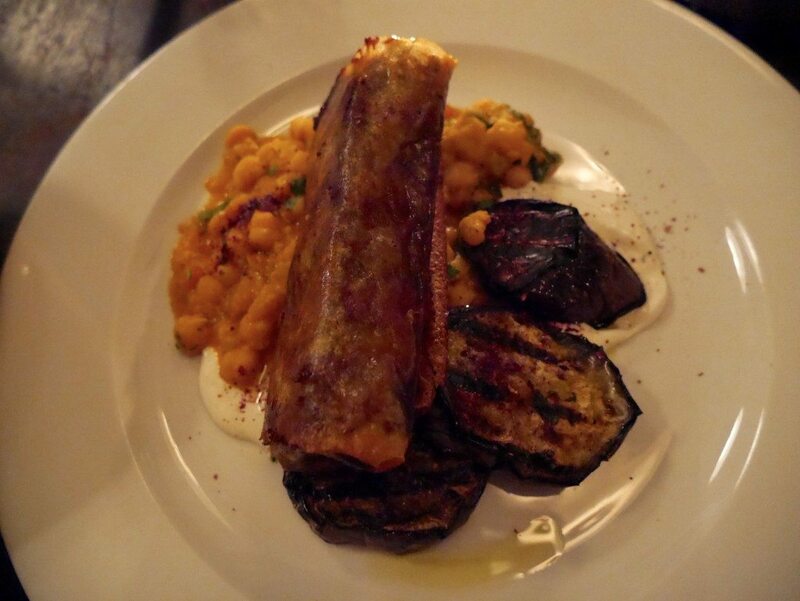 But the accompaniments of firm, floury chickpeas; flaky filo pastry; tender, meaty aubergine; and cool, creamy yoghurt made every mouthful a taste sensation that took you on a real culinary journey. It was a generous hunk of meat for the price and we fought over every last scrap. The spring greens were not at all as expected, arriving as a small plate of humble iceberg lettuce and pine nuts, I was at first a little disappointed. However, looks can be deceiving, and upon actually tasting the meagre looking leaves was pleasantly surprised to learn that they had been flash friend in a rather moreish combination of olive oil, garlic & chili. The pine nuts were a great final touch, making this cooked pile of leaves a tasty, crunchy, nutty delight. By this point we were all rather full, but we simply couldn’t resist ordering another round of certain dishes, and one final newcomer. 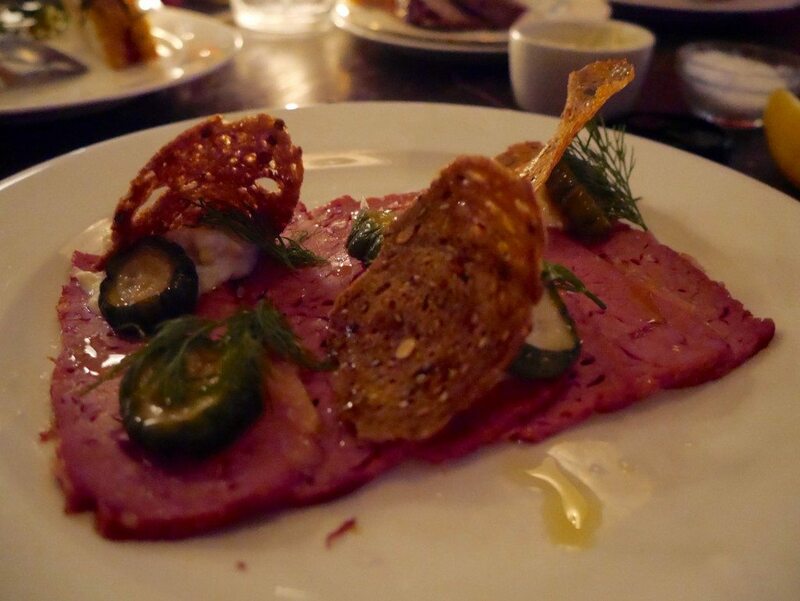 Thus, another salt beef, pickled cucumber & horseradish (£8.00) and gnudi, leeks, wild garlic & morels (£7.00) was on the cards, plus a rabbit, mash, broad beans, black pudding & tarragon (£17.00). I think I’ve already made my feelings on the salt beef and gnudi pretty clear, so I will just rabbit on with our last savoury dish of the evening (yes, I’m funny). The rabbit was a hearty dish, with a large piece of lean, well-cooked rabbit resting on a generous spoonful of buttery-smooth mash. 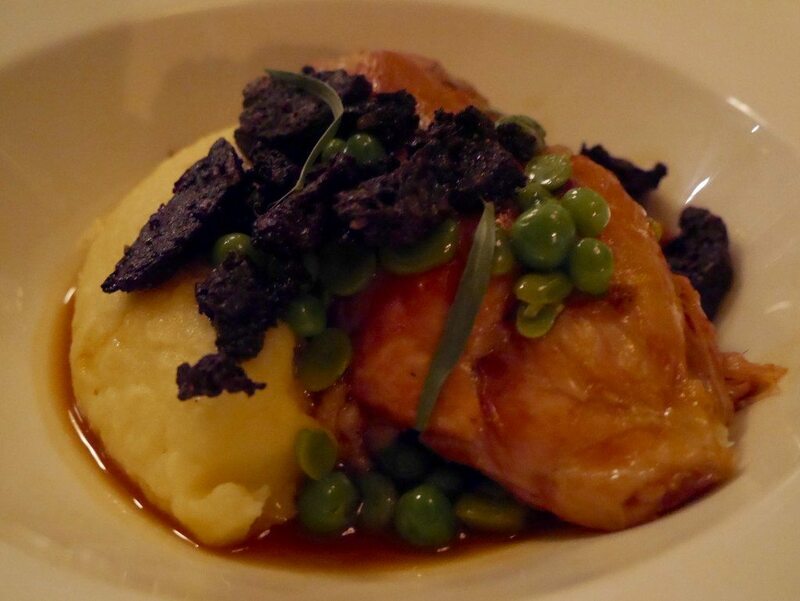 I personally dislike the strong flavour of game and the dryness of broad beans, but as a lover of black pudding the stodgy consistency added a different texture to every bite. The gravy was rich and the tarragon poignant, bringing the dish together nicely. It was a birthday celebration, and what (decent) birthday is complete without cake? Dessert time at last. Three of us ordered the chocolate toasted sandwich, milk sorbet & salted caramel (£6.00 each) (the obvious choice), whilst others opted for the honey cake, whisky ice-cream & pine nuts (£6.00), and the selection of ice-creams (£5.00). The chocolate toasted sandwich was EPIC. The ‘sandwich’ consisted of two super slim slices of fried bread supporting an exceedingly rich, moist & dense chocolate sponge. 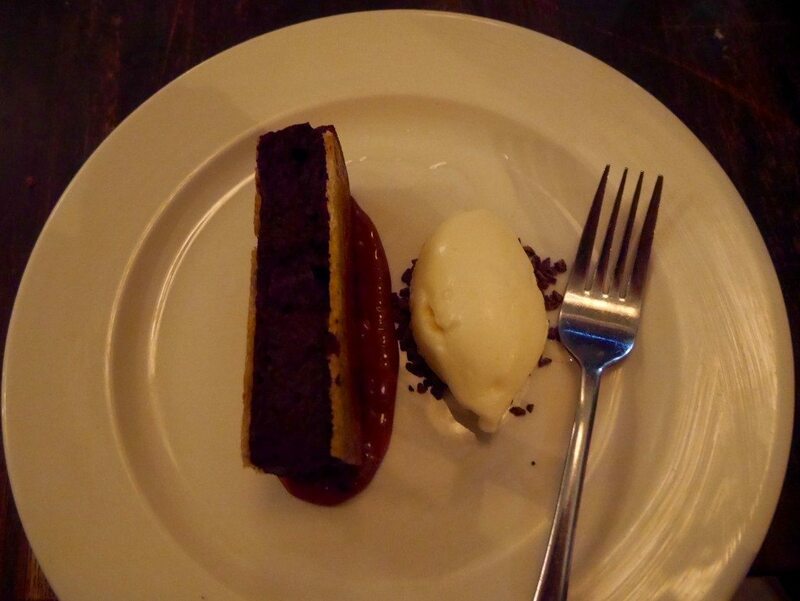 The bread provided crunchy-chewiness whilst the chocolate was super smooth and ridiculously decadent. The salted caramel puddle and milk ice-cream provided some wetness for the teeth-stickingly good sandwich. I absolutely loved this pudding, but if I were to have it again I would request to switch the milk ice-cream for vanilla, as the milk flavour was too delicate for this dish (and vanilla is just better…). 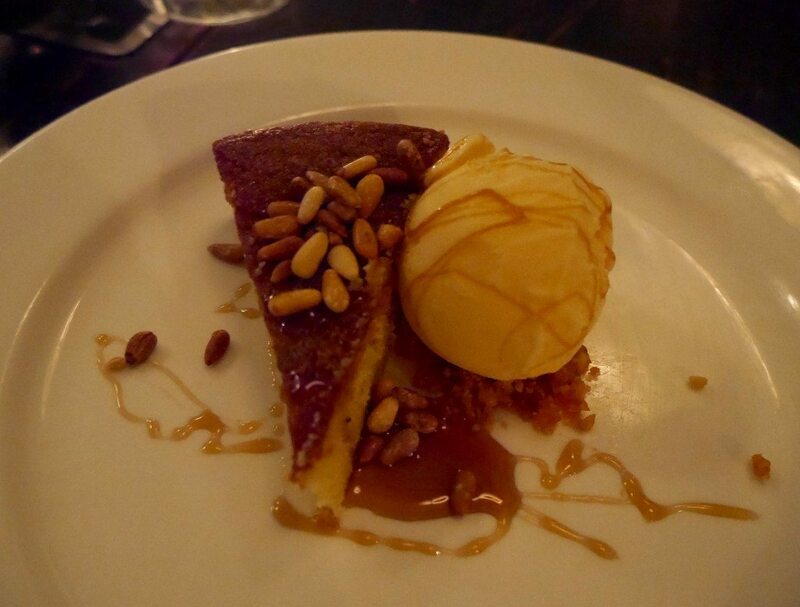 The honey cake, whisky ice-cream & pine nuts (£6.00) received mixed reviews. The two actually sharing it non-stop raved about it, whilst I found the sponge to be a little on the dry side. The liberal drizzle of lip-smackingly good caramel sauce entirely made up for this though, whilst the toasted pine nuts brought a sweet crunch to the fore. It was a good dessert but it had nothing on my EPIC (yep, second time) chocolate toasted sandwich, in my opinion. I didn’t take a picture of the selection of ice-creams (£5.00) as, firstly, it was now very late, dark, and I had had a fair few glasses of wine and, secondly, it was just 3 scoops of ice-cream… I respect that some people like this as a dessert but, for me, ice-cream accompanies the star, or sits atop a huge whopper of a homemade waffle cone and is packed full of crunchy bits & bobs. However, the bowl was licked clean so I imagine for the pure ice-cream dessert lovers out there it was of more than an acceptable standard. Price: Since 4 pretty special bottles of wine were ordered I have deducted them from the final cost, and can tell you that to feed 6 bottomless diners we racked up a total bill for the food alone of £182.25, including service. I.e., £30.00 a head without drinks. I think that this is excellent value for the quantity and quality of food that we consumed. Although the dishes were, admittedly, a little hit & miss, those that hit damn well exploded, and if you stick with the salt beef, gnudi and lamb (if they have them on the menu, and you should pray that they do), then you are on a sure set fast-track to food ecstasy. And if all else fails, just eat the bread. Well, I really loved 10 Greek Street and now I want to come here for the bread alone! Actually we’ve randomly been here for dessert before but I’d like to come and try in properly. I love Happiness Forgets and have always passed by 8 Hoxton Square without giving it much thought. Now I do want to try it out, that gnudi sounds amazing! Oh, this looks delicious! Will have to try it next time I visit.